At Accorde Orthodontists, we strive to be your top choice when you’re looking for a kids orthodontist in the Rogers & Osseo, MN areas. We’ve been providing superb orthodontic care for those in the northwest suburbs for decades, happily serving the community through our three convenient office locations. Our office locations are found in the proximity of several elementary and middle schools, and that is no coincidence or accident — we strongly believe in the importance of early orthodontic treatment to check for problems and treat them before they become more serious. Why Is Early Orthodontic Treatment So Important? According to The American Association of Orthodontists, it’s recommended that children have their first orthodontic screening by the age of seven. There are many ways children can benefit from seeing an orthodontist earlier in life, though it’s important to note that early visits don’t always lead to early orthodontic treatment. If orthodontic work may be needed, the orthodontic experts at Accorde Orthodontists will monitor your child’s growth patterns until we find the ideal time to begin orthodontic treatment. This allows us to not only prevent future problems, but also get the best possible results for your child. Typically, early orthodontic treatment for common problems is done between the ages of nine and 14. This is generally when all the baby teeth have fallen out and permanent teeth have broken the surface. However, there still are some conditions that are much earlier to treat if they’re caught earlier in life. One such condition is severe crossbite. This condition is where the upper teeth close inside the lower teeth. In order to treat this problem, a device called a palatal expander can be used. The palatal expander is used to gradually and painlessly widen the upper jaw and is far more effective when the jaw hasn’t fully developed. If a patient waits too long to come in for treatment on a crossbite, a more complicated treatment, such as oral surgery, may be required to treat the condition. 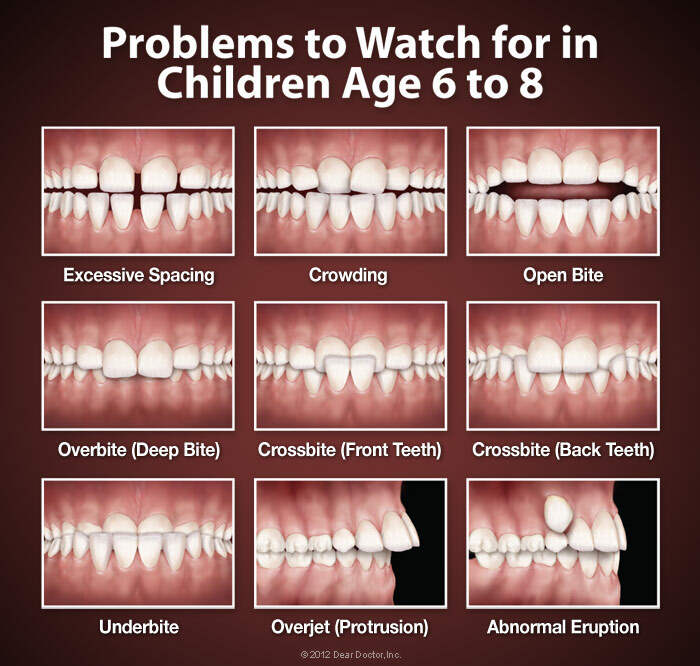 Severe crowding is another condition that can benefit from early orthodontic treatment. This condition occurs when the jaws are too small to accommodate all of a patient’s permanent teeth. Palatal expansion or tooth extraction may be recommended to create more room and to help the permanent teeth erupt properly. Even if braces are needed later, the treatment time will be shorter and less complex. Early orthodontic treatment can also be very helpful in treating some other problems as well. Protruding teeth, especially ones in the front, can be prone to getting chipped or damaged, and may unfortunately lead to a child having poor self-image. A severe underbite, where the lower jaw grows much larger than the upper jaw, can result in serious bite problems. Orthodontic appliances, such as braces and headgear, can be used to correct these problems much easier at an early age, before surgery may be required. Anyone can pick up a habit, but some of these habits can actually be detrimental to a child’s oral health. 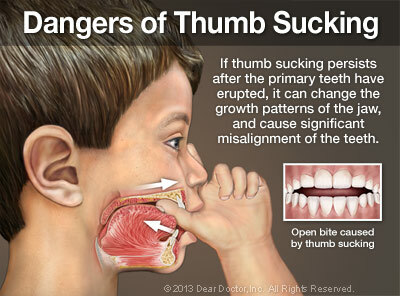 Bad habits such as thumb sucking, tongue thrusting, and mouth breathing can actually negatively affect the development of the teeth, mouth, and jaws. Thumb sucking is a reflex that’s natural in early childhood and usually disappears between the ages of two and four. If this habit persists much later than that, the pressure of the thumb on the upper jaw and front teeth can cause the jaws to change shape and the teeth to move apart. This may lead to impaired speech and also lead to the orthodontic problem called open bite — where a gap is between the upper and lower front teeth when the teeth bite down. Tongue thrusting (also called ‘reverse swallowing’) is a behavioral pattern where the tongue protrudes through the anterior incisors during swallowing, speech, or other activities and can also cause open bite due to the tongue’s recurring pressure on the teeth and jaws. Mouth breathing is an abnormal breathing pattern where the mouth always remains open and passes air directly to the lungs. This habit is related to alterations in the muscular function of the tongue and face. It can cause both the upper and lower jaw to grow abnormally, leading to serious orthodontic problems. Mouth breathing may start from a physical difficulty, but it can turn into a habitual action that’s tough to break. At Accorde Orthodontists, we’re knowledgeable in a variety of orthodontic treatments that can help correct these habits. The sooner these problems are taken care of, the less damage they can cause. However, these problems aren’t always immediately recognizable, which is why you should bring your child in for an early orthodontic screening to your Osseo and Rogers, MN kids orthodontist. If you’d like know if your child is a candidate for braces or would like to get them started with early orthodontic treatment, we encourage you to fill out our appointment request form. Alternatively, you can contact us us at one of our three convenient locations if you have any questions or would like to schedule an appointment. We hope to hear from you soon!